Well, the title should really be Shooting Car, since we’re gonna talk about just one motor. Mercedes Benz and theroadtonirvana.com have, through downright amazing photography, created a relationship unlike anything else we’ve been a part of. 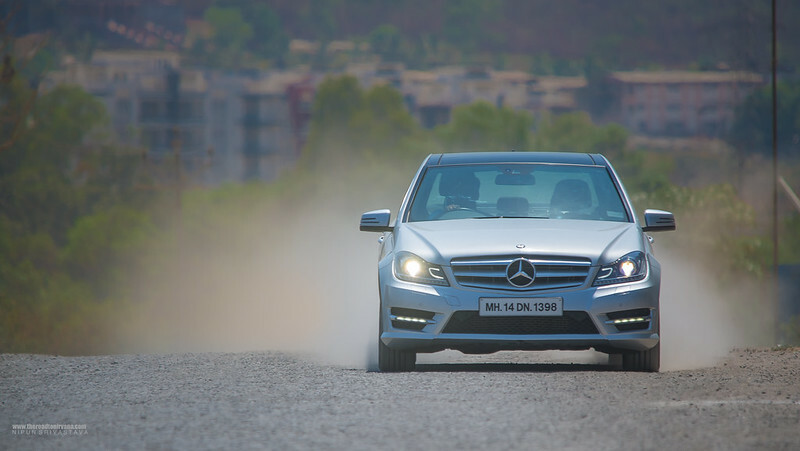 Continuing the same, we shot the C-Class earlier this year in all its glory, right here in Pune, India. Our Home! We LOVE our motoring. What we love even more than that are vehicles which make magic happen. 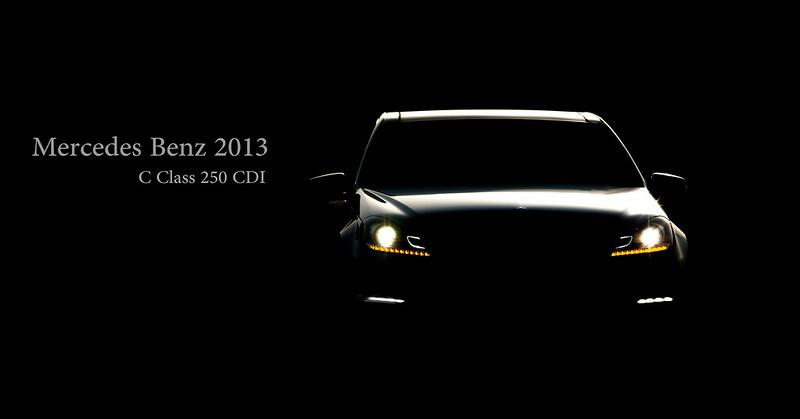 Both on the road and in front of the lens, there are some cars which truly take the cake. 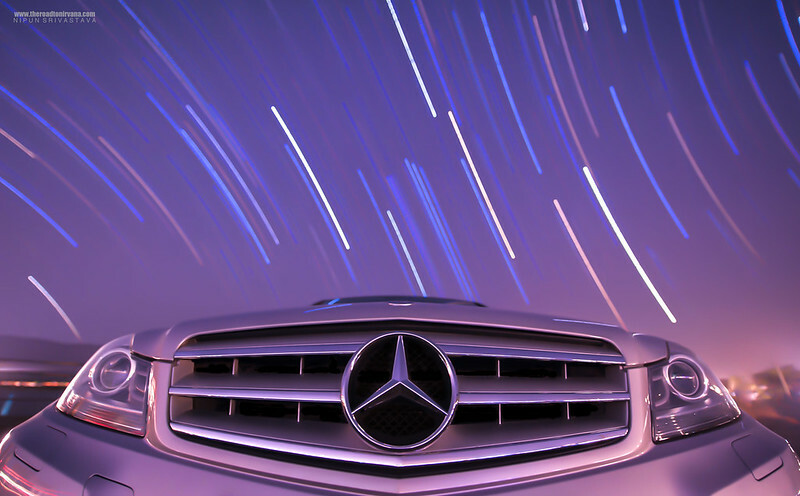 The 2013 Mercedes Benz C-Class is one such epic motor. Here we go! Gift wrapped in a package of precise and confident design, the 250 CDI was delivered to us and we were told, it is your way or the highway. You know what though, “our way is the highway!”. You see, it’s all about analogies when it comes to motoring. Magic – is one such one-word analogy. What is absolutely imperative for us before shooting any vehicle is the fact that there must be a connection between the photographer and the ride. That is, we need to take these beauties for a spin – a good old fashioned drive through the country. 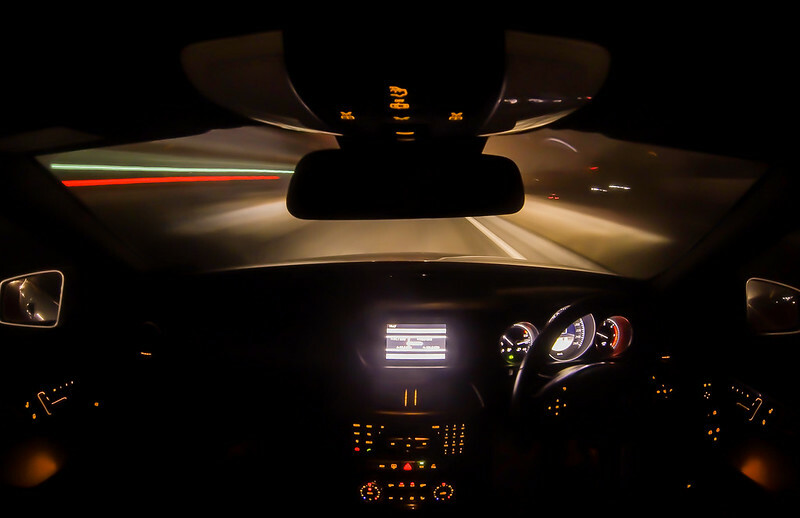 More often than not, triple digits and then some on the speedometer builds a connection of sorts between the vehicle and its driver. “I begin to trust the vehicle and that helps me feel right at home shooting these cars and bikes” says our lead Photog Nipun Srivastava. We agree! We’re a little selfish in most our endeavors here at Nirvana. What we mean is, “motoring” is great but what use is motoring if one doesn’t travel? You don’t just simply head out looking for shots, no. You head out looking for an experience, photography, just happens. That’s what we believe and that’s what helps us grow as photographers, travellers AND motoring enthusiasts! Head out, chase the Sun. 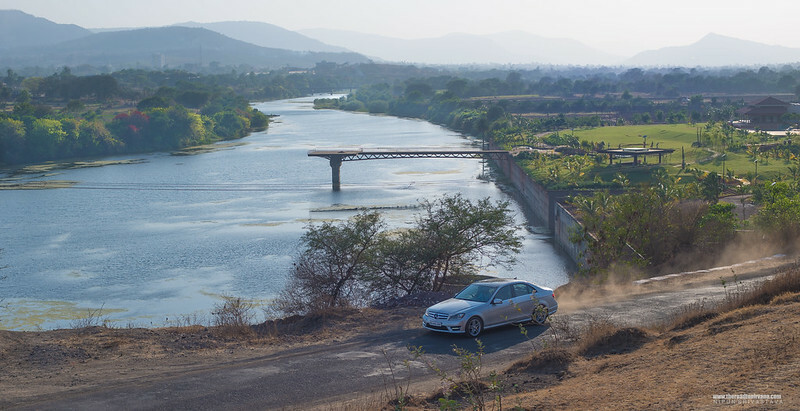 Nipun drove the C-Class onto back roads which surround Pune city amidst the Western Ghaat hills of India. “How can you not have a sunset shot?” we thought just as we roared off on one of our signature short drives onto unknown roads. Pune, incidentally is also the home of Mercedes Benz in India. The assembly plant for these cars is just a 30 minute drive away. 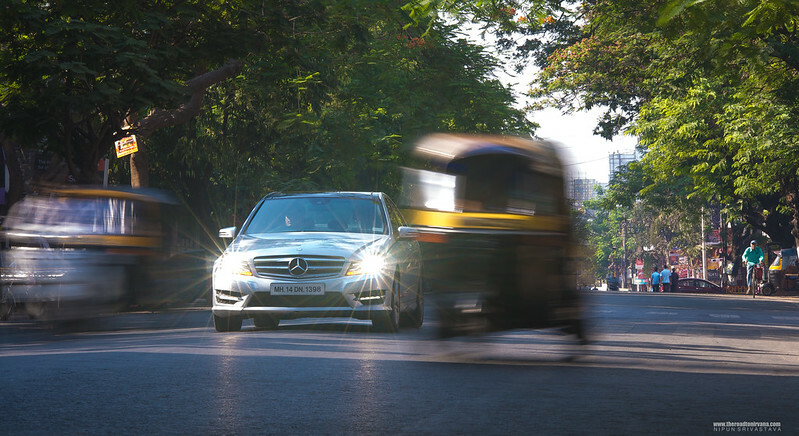 It was mandatory for us to showcase the C – Class on the roads of our city. We made our way to Pune’s shopping street, the Mahatma Gandhi Road! Driving this C-Class Mercedes is a pleasure. The handling is damn crisp at high speeds which inspires confidence on the road. Then comes the interior which was pretty chic and gave us all the luxury we asked for with every touch. For a car of its class, in India the C-Class is slightly overpriced according to our experience. Still, no harm in dishing out dough for quality. One shortcoming the C-Class shares with most its counterparts is the lack of adequate ground clearance for Indian roads, there’s just no way around that one. She drives smooth with a ten-on-ten automatic transmission but you do get flappy-paddle mode which takes a little getting used to. On the whole though, we would buy this baby. 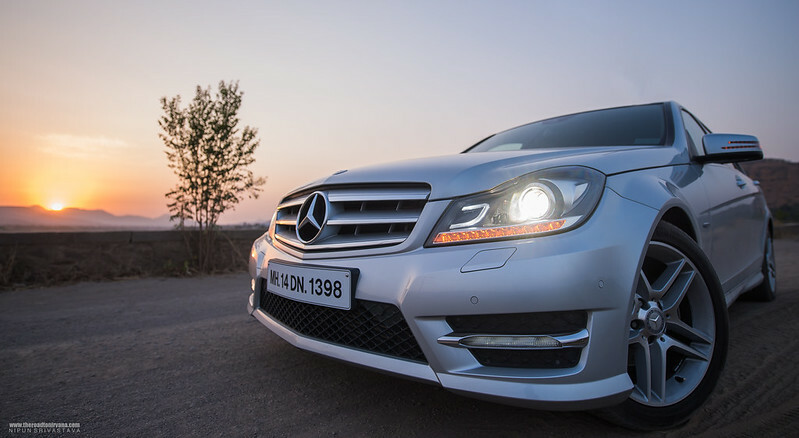 No grille or combination rings can outclass the three pointed star on Indian roads! Wink! THE SPORT MODE: Yes, we did press that pretty button. The C-Class revs higher in Sport and other boring things change to give back a sharper, more fun ride. After our mandatory road-tests were done, it was time for us to do what we do best – have fun with our cameras! We put in close to three hours scouting for and setting up a single shot and then we shot the star among stars! You won’t believe how awesome peanuts and diet coke taste out in the cold sitting beside self clicking cameras and a beautiful car. And then when the final shot comes out of processing, it just makes us swoooooooon! Shooting this car over three days was a fantastic experience for us. There are few things we value more than good vehicles, good places and good people. This shoot was right up there with some of our best over the past three years. Having said that, ladies and gentlemen, this is just the start. There’s a BIG Nirvana surprise coming soon! Hint: It loves flying! A Masterclass in Quality, Mercedes Benz. 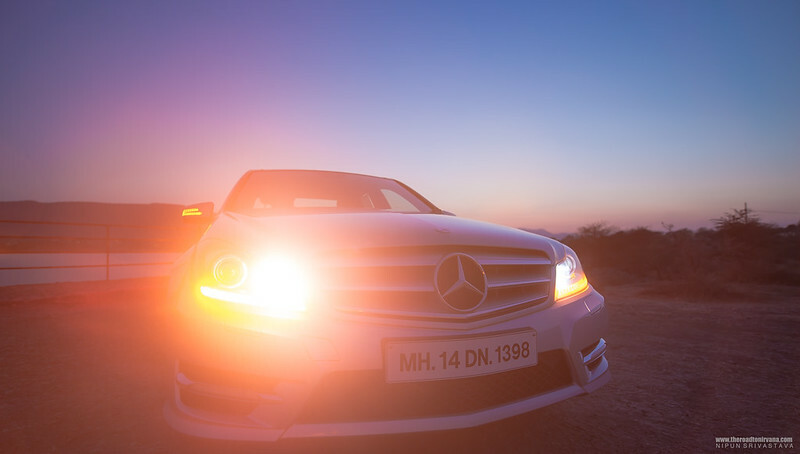 For all their awesomeness, we would like to thank Mercedes Benz Stuttgart, Mercedes Benz India for blessing us with the car and a BIG thank you to the master drivers who helped us navigate through each step of our insane shoot! This entry was posted on October 25, 2013 by Nipun Srivastava. It was filed under Motoring, Photography and was tagged with C-Class, car, CDI Three pointed star, class, design, drive, driving, engineering, india, logo, Mercedes Benz, motoring, Nipun Srivastava, photography, sedan, star trails, Travel, www.theroadtonirvana.com.